’Velvet’ the 17th of November 1989? This year we commemorate 25 years from the revolution indicated as ‘Velvet‘. It would be a mistake to assume its process was really so smooth and calm. 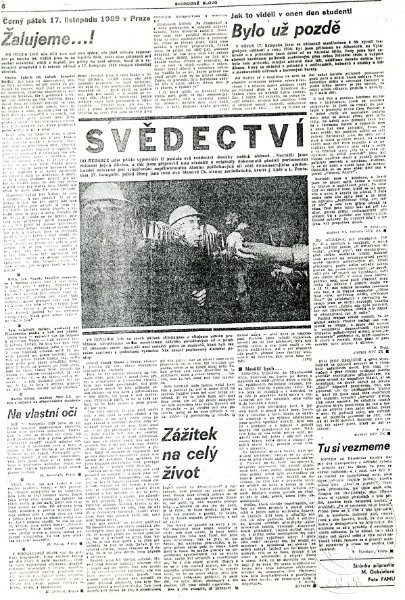 The events surrounding the demonstration on the 17th of November 1989 have a dramatic character and they started the process that resulted in the collapse of communist regime in Czechoslovakia. For this day, the university students planned to commemorate the death of Jan Opletal. The Municipal University Committee of SSM (Socialist Union of Youth) also participated in the event organization. The Union members were also critical as regards the existing regime at the time. Together they presented the proposal to the Municipal Committee of the Communist Party, which did not permit the realization under the existing conditions. The students then adjusted the route to avoid the centre on the way from Albertov. The students were supposed to walk towards Vyšehrad to the tomb of K. H. Mácha. After this change, the Municipal Committee accepted the proposal and permitted the manifestation. Later, the organizers were assured the members of the State National Security units would not intervene providing the students do not violate the agreed plan. The organization committee met with the opposition members and asked them to refrain from sharpening the situation and intervening in the manifestation course, so the state bodies will not have any pretence to intervene. The organizers received this assurance. At 4 PM, the manifestation started in Albertov with the sound of the academic anthem 'Gaudeamus igitur‘. The present members of theState National Security estimated approximately ten thousand people participating in the march.More and more people kept coming. The area in Vyšehrad was completely full.The selected individuals then placed flowers on the tomb of Karel Hynek Mácha and the national anthem sounded in Slavín sung by a quire of comprising of several thousands of voices.This great mass of people worried the security bodies. Their worries grew at the moment the manifestation started openly changing into demonstration, the crowd continued from Vyšehrad to the centre.Undecided protectors of order tried to block off Vyšehrad Street.The first disturbances and arresting occurred here.The rear part of the crowd turned back and the demonstrating students headed to the centre on the riverbank. The National Security Unit had clear instructions:Prevent the crowd from walking to Wenceslas Square and to the Castle.